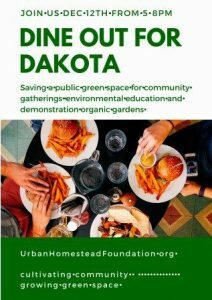 The Urban Homestead Foundation is partnering with West Seattle restaurants on December 12th for a Dine Out event that will help raise money for the purchase of a property located at 50th and Dakota, across the street from Genesee Hill Elementary school. This property will be the location of the Dakota Homestead and will be developed into a vibrant corner of sustainable green practices and urban agriculture, providing a place to celebrate our natural resources through demonstration gardens, classes and seasonal events. The space will also serve as a food hub and seed lending library, connecting neighbors with each other and local farmers. In addition, the land will provide a wild space for schools to use as curriculum enrichment in topics such as edible gardening, urban wildlife, seasonal cooking, crafting and home finances.